Go home Diabeetus, you are drunk! And then there are times when there is no explanation whatsoever. Or at least not one that we can come up with. I think that perhaps when a unicorn farts in the woods, it’s somehow connected to BG levels and sends everything on a roller-coaster ride. Like today, for example. V’s fasting BG is a little on a higher side at 170 but nothing we will freak out about. She eats her breakfast, cereal with milk, and is actually a much lower carb content than her usual breakfast. Almost three hours later, when her BG should be returning to a normal range, Dexcom starts alerting us that BG is over 300. At 10:10 she checks and sure enough it’s 315. If it were an hour after breakfast at least it would be somewhat understandable. But nearly three hours later? Beats me. She administers insulin correction. At 10:50 she is getting ready to eat and checks again, and now she is down to 136. Yay, right? Well, sort of. She went from 315 to 136 in 40 minutes. That must have been a fun ride! The pump does not give her any additional insulin for her lunch carbs because there is enough insulin active in her body. Good safety feature, right? Except despite eating a good lunch – grilled cheese sandwich and celery with peanut butter – V continues to drop. She tests at 11:30 and she is 59, feeling weak and shaky. What gives? Go home Diabeetus, you are drunk. Either that or those unicorns must have been eating a lot of beans lately. Exercise is wonderful for diabetics because it decreases insulin sensitivity and allows the body to absorb more energy from glucose even without insulin. But it is also very tricky because its effects are not always easily predictable, and can last or kick in hours after physical activity is over. T1Ds are especially at risk for BG drop during physical activity. As V is in gymnastics, swimming and BMX, we are constantly dancing the dance of BG management. First of all, not all exercise is created equal. We have to think about duration, level of intensity, and consistency of intensity throughout the duration of physical activity. PE in school? Not a big deal. V is rarely moving for all of 30 minutes and intensity varies. Swim class for 30 minutes? Tricky. Sometimes they are doing technique drills of lower intensity for the majority of the class. Sometimes they are swimming back and forth for the majority of the class. Sometimes it’s a mix of both. BMX and Gymnastics is a little more predictable in a sense that it always involves high intensity physical activity for almost the entire two hours. Park playground? Who knows? Sometimes V runs around non-stop, and other times she sits in the shade and hangs out. Over the last year we learned to be prepared to deal with any scenario but we still have ways to go to really understand how exercise impacts her BG. Sending a child without diabetes to a 2 hr. gymnastics class is simple: drop them off. What we need to do with V ends up being a long drawn-out production. Our BG management begins at least an hour before class. V needs a meal or snack that has a good amount of protein to slow the absorption of carbs. Right before V starts the class we look at her CGM for a guideline. If it says she is under 150 we test. If she is indeed under 150 she gets a 15 g. carb snack and we also lower her basal insulin by at least 30%. We’ve seen V drop from 250 to 70 in under an hour so we will not mess around. If her BG closer to 200 we may opt out of testing but still reduce basal insulin. If BG is between 200-250 we may reduce basal insulin or wait and see for a little. Over 250 we observe what happens in the first 30 minutes and act accordingly later. V gives her CGM to gymnastics instructor who keeps it on her clipboard, so that CGM always stays in range. From then on V is responsible for monitoring her BG. If she is observing the downward trend, she needs to grab a snack or a fast acting sugar. She always keeps an arsenal of protein bars, gels, glucose tabs and fruit rolls in her backpack. When we are trying to maintain her BG level, she will have a part or whole protein bar. When we need to bring BG up we evaluate where she is at and either give her something with protein or, if she is dropping below 100 for example, may just go with a fast acting sugar. By now V is well versed in this fine art of BG management and we trust her to make good decisions. We are not always sitting there and watching her, even though often we are in the vicinity. It’s important for us to give her space to figure out how to be independent, even when it means she may forget to monitor BG closely and ends up needing to treat a low that could have been prevented. Rules change about lows during physical activity. Going below 100 is as low as going below 70 – it’s just a matter of a few minutes – so we need to be proactive and try to keep BG levels at around 150 as much as possible. Once we get home, we have to keep a close eye on the BG levels still. It’s not uncommon for V to be affected into the night, so we may have to keep her basal insulin at a lower level for hours after she is done with the class. Yet other times things are back to “normal”, if you will, soon after class, and we have not yet been able to nail down the exact pattern. CGM has been enormously helpful in managing BG during and after exercise. Observing the trends helped us get a better understanding of patterns and reduce the number of times V needs to test. It alerts us when BG is dropping rapidly and when it reads below 75. We are more proactive in preventing lows. On a good day we are able to avoid them altogether and keep V in a good range. On a bad day she will still drop but we will catch a low early when it’s mild and quickly correct it. There is never a time when we can forget about diabetes during physical activity. Even simple things like a family bike ride involve stops to check BG, give V a snack or treat a low. However, as we gain more experience and get help from CGM we can focus a little more on the fun and a little less on the fine art of BG management. V’s transition to GF diet was pretty easy. Because my Dad has Celiac, we were already very familiar with it as well as with many GF options, and also saw it as part of the “normal” spectrum, if you will. It’s a good time to have Celiac, compared to even just a few years ago. Anyhow, I digress. It’s easy at home because we only cook GF meals. We have regular bread, cereal and a couple of snack items but everything else is pretty much GF. If it weren’t so pricey we would have a 100% GF household at home. But once we step out, it’s constant vigilance, label-reading, question-asking, accommodations, substitutions, and the like. And then there’s feeling bad. We have amazingly supportive friends who understand V’s needs and always make accommodations. When we have a potluck, even though I always make a point of saying that I will bring GF options for V our friends always make a point to go out of their way and provide GF options. And often they add a carb count to boot. We are hugely appreciative and at the same time I sometimes feel really bad that they have to jump through hoops for us. Sometimes I long for the simple times when we can grab whatever on the go, eat at any restaurant, and not have make special preparations for every outing and party. 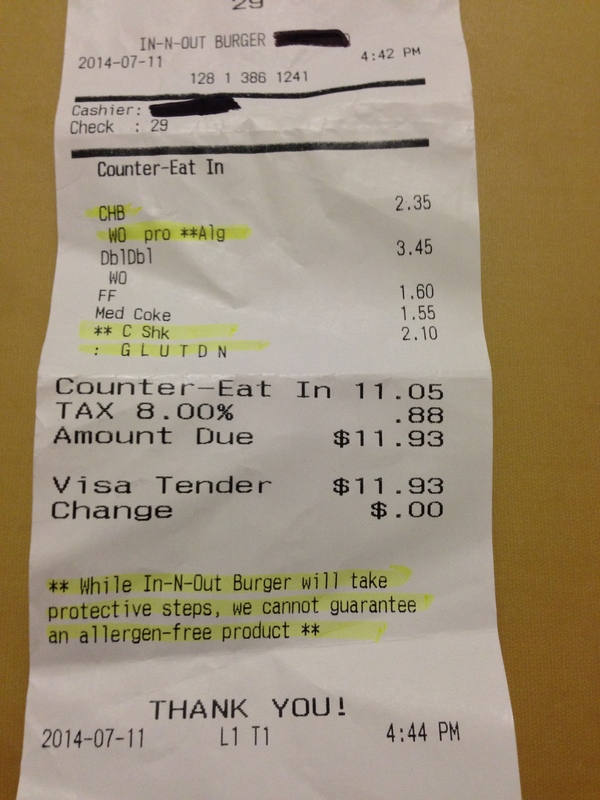 Granted, having to accommodate V’s GF diet and be mindful of carbs helped us all eat a lot better. But for once it would be really nice to not worry about any of it. 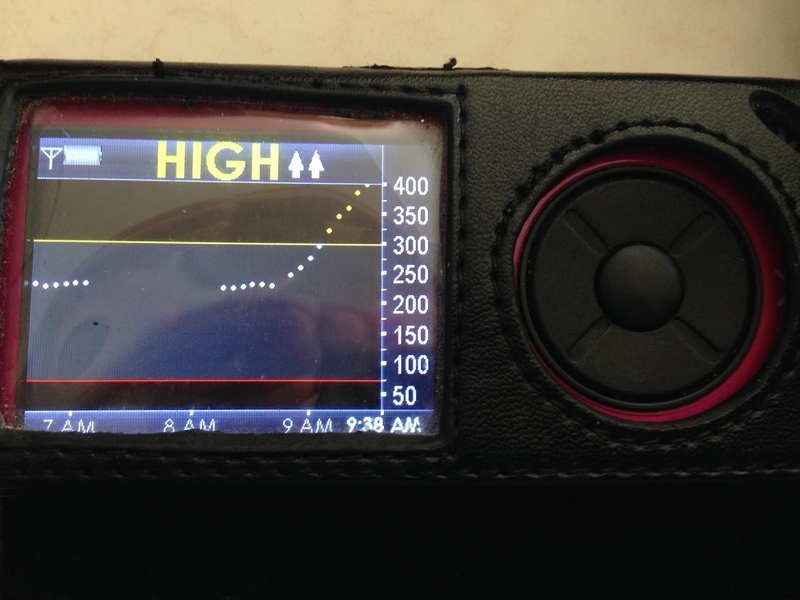 This is Dexcom telling us that BG is over 400 (it does not produce readings over 400) and rising rapidly. 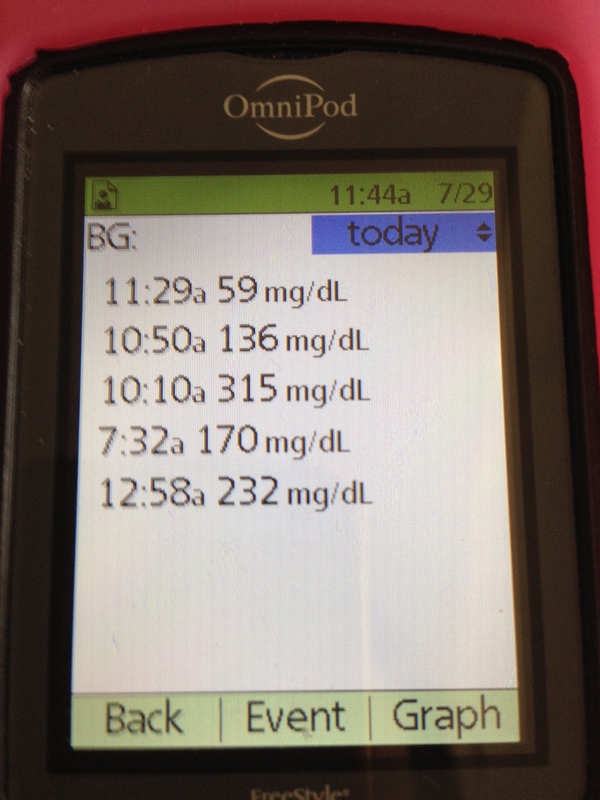 And this is all despite increasing her basal rate, checking BG frequently and giving her a lot of insulin. 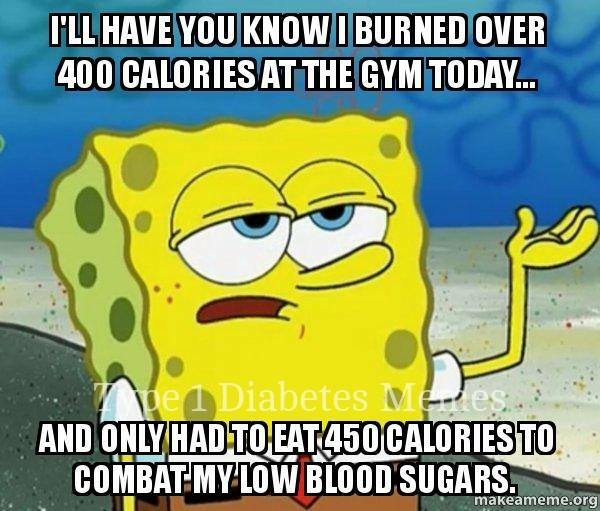 Unfortunately, with Diabetes even a simple illness can wreak havoc with BG and it can be very difficult to manage. It is a combination of the stress of illness on the body, inactivity, and who knows what else. V did OK, she felt more or less unaffected by high blood sugar, did not have ketones, and we did manage to bring it down into a good range by dinner time of the second day. We are lucky. So far V has not been prone to developing ketones when she’s ill, and she has been able to stay well-hydrated. Other kids can get very, very ill as a result of something minor. They can become dehydrated, or/and quickly go into DKA (Diabetic Ketoacidosis), and may need to be hospitalized. It took us two days to get BG readings into a reasonable range, despite having all this technology at our disposal. And still we do not have a guarantee of how the rest of the night and tomorrow will go. Diabetes management during illness is almost an oxymoron.